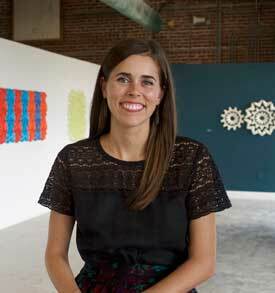 Through her slip cast wall-tile installations, Jackie Head seeks to create environments that envelop the viewer. She draws inspiration from the geometric patterns found in Islamic art and is specifically interested in tessellated patterns and penrose tiling. Jackie's work considers visual planes both individually and as a whole. The act of amassing individual tiles on the wall such that they construct a larger pattern can develop either a sense of comfort or tension for the viewer, creating an environment that resonates differently with each person. Jackie's interest in ceramics began in high school. She received a Bachelor of Science in arts management and a BFA in ceramics from Indiana University Bloomington in 2014. In the summer of 2014, Jackie studied abroad in China and worked at the Pottery Workshop in Jingdezhen. She currently resides in Indianapolis, IN, where she maintains a private studio.